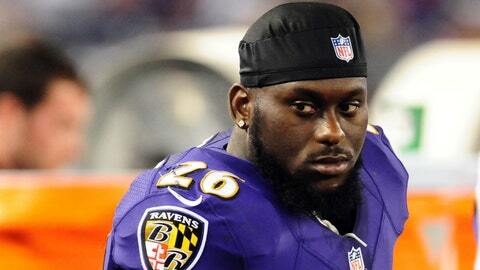 Apparently, Matt Elam didn't catch that Lions-Cowboys game earlier this season. Calvin Johnson has been called plenty of things throughout his remarkable seven-year career but it is hard to remember "old" ever being one of them. According to ESPN, as the Ravens prepare for their Monday night matchup with the Lions, Baltimore safety Matt Elam began Wednesday’s chat with the media by saying all of the right things about the dominant Lions wide receiver, spouting out compliments at a rapid-fire pace. "Big, fast, athletic, unstoppable, freak," Elam said. "He’s pretty old, so I don’t know how physical he’ll be . . . He’s a big guy, but he’s older. I guess when they get older they’re not going to be as physical, you know what I’m saying? We’re going to have to be physical, make him uncomfortable." Elam may be a rookie and six years younger than the 28-year-old, but Johnson’s "old age" hasn’t exactly slowed him down as he’s amassed 1,351 yards receiving this season to go along with 12 touchdowns. Elam may also have a difficult time making the 6-foot-5, 236-pound Johnson feel "uncomfortable" on the gridiron, with the safety standing seven inches shorter than Johnson and about 25 pounds lighter. And then there’s this: The last time an opposing player made somewhat outrageous claims about Johnson was before Week 8’s game between the Lions and Cowboys in Detroit. In the days leading up to the game, Dallas receiver Dez Bryant confidently told reporters that he could do anything that Johnson could do. That Sunday, Megatron went off for 329 yards, while Bryant only hauled in 72. Elam probably shouldâve learned from Bryant’s blunder, but this can likely be chalked up to a rookie mistake — something the elder Johnson doesn’t have to worry about anymore. And to his credit, Elam is already backtracking.